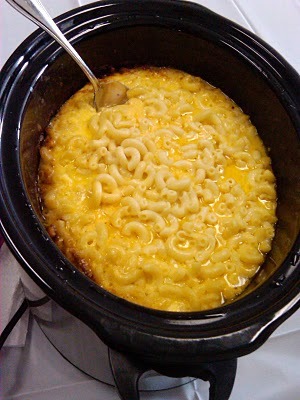 Well, I have to say, I LOVE this version of Slow Cooker Mac and Cheese! Why? You put the noodles in dry, uncooked!!! Yep, you read that correctly! For me, dumping in the ingredients and starting the crock pot is the whole point!! I don't like crock pot recipes that require other cooking steps first. This one is truly a one-pot dish. I got it many years ago from the newspaper. It is a tried and true one. Jans tips: between the 3-4 hour mark on low, the edges start to get that crispy, cheesy edge. My kids love that part, but if yours don't you'll want to make this when you know you can cut it to warm or serve it at about the three hour mark. The original recipe called for 1/4 tsp. salt , but I increased it for my own taste preferences. You can cut it back down if you prefer. Update: May 16, 2012: I've had a few people try this and report back some mixed reviews on the recipe. Although I've never had the same issues, I wanted to you to be aware. I think most of it comes from being unfamiliar with the Southern custard style mac-n-cheese, which is meant to be thick!